Problab Technologies Pvt. Ltd.’s Email marketing training course in Chandigarh will train you on the advanced email marketing strategies to use mailers as an effective marketing medium. The training covers all the features of email marketing – email metrics, landing pages, spam and blacklists, mailing lists, marketing automation and many more. This Email Marketing Training Course in Chandigarh is designed to make you an accomplished email marketer. Email Marketing is Easily Shareable. How to make email database? How to design an email? Implement effective email marketing campaigns to achieve your business goals. Leverage the best tactics of email marketing to reach a vast audience across the globe. Impact conversions for your product/brand through email marketing communications. “67% of MARKETERS say that delivering highly relevant content is a strategic goal their organization wants to achieve through email Marketing”. 12+ years of experienced professional trainers. 100% Practical classes on Live Projects. Our Aim is to provide you the best Email Marketing training classes. 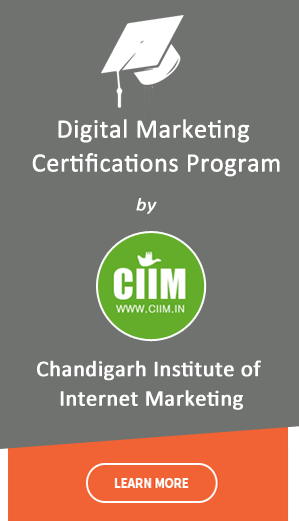 Course : Email Marketing Training in Chandigarh. Duration : 3O – 45 Days, Email Marketing Training in Chandigarh.